Julia Soaemias, daughter of Julia Maesa and mother of Elagabalus, was, like her son, fanatically devoted to the workship of the Sun-God Elagabalus. She was murdered at the same time as her son in A.D. 222. Obverse: IVLIA SOAEMIAS AVG, Draped bust right, wearing stephane. Reverse: VENVS CAELESTIS S C, Venus Caelestis standing left, holding apple and scepter; star to right. Obverse: IVLIA SOAEMIAS AVG, Draped bust right. 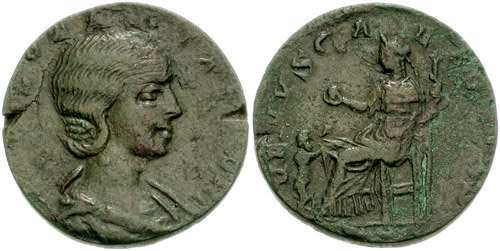 Reverse: VENVS CAELESTIS S C, Venus seated left, holding apple and scepter; to left, small figure of Cupid standing right, extending hands to her.